This 300 large piece jigsaw puzzle is designed by Linda Picken and measures 51cm diameter. Available in two piece count. 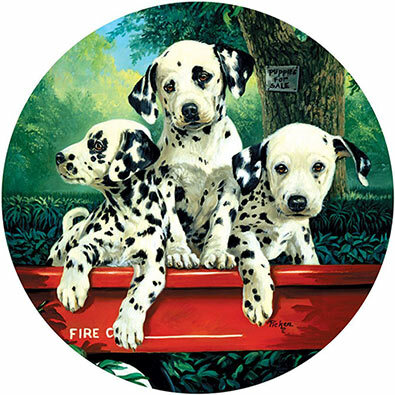 This 300 large piece jigsaw is designed by Judy Mastrangelo and measures 50 cm diameter. A small angel tends to a blooming garden. Available in two-piece counts. This 300 large piece jigsaw is designed by Alan Giana and measures 50 cm diameter. A river cuts through a green forest full of blooming flowers. This 300 large piece jigsaw is designed by Rosiland Solomon and measures 50 diameter. Two cardinals guard their nest of eggs hidden between flowery branches. Available in two-piece counts. This 300 piece jigsaw is designed by Elissa Della-Piana and measures 51cm diameter. This round jigsaw puzzle is available in both 300 large pieces and 1000 standard pieces.